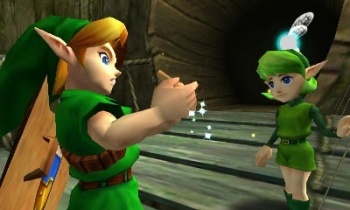 Technical troubles with the N64 nearly made Ocarina of Time an FPS. More than 12 years after its release, its hard to think of Legend of Zelda: Ocarina of Time as anything other than a third person adventure game, but according to Nintendo, the game could have been very different, with Link appearing significantly less often. Speaking in the latest "Iwata Asks," Yoshiaki Koizumi, who was in charge of the game's 3D system, story, and character design, said that Super Mario 64 had shown Nintendo how difficult it was to show 3D characters on a wide, open field on the N64. He said that Miyamoto wanted to sidestep that problem by using a first person view, with fights playing out in a side-on viewpoint, similar to Legend of Zelda II: The Adventure of Link. Ultimately, Nintendo scrapped the idea after it was found to be visually uninteresting, paving the way for the Ocarina of Time we all know and love. This decision also led to the creation of Z-Targeting - essentially a lock-on system, mainly used in the game's fights - as a way of getting round problems managing the camera. Koizumi and another developer, Toru Osawa, visited a the Toei Studio Park in Kyoto - the studio behind anime like Dragon Ball Z and Sailor Moon - and watched a live action samurai combat show. Watching how the fighters circled each other and attacked one at a time proved instrumental in the creation of a fun and manageable combat system. If you're a fan of the Zelda games, then you'll probably find the rest of the "Iwata Asks" fascinating, and honestly, it's pretty interesting even if you're not that much of a fan.